This melody, widely played today as a beginners' melody and not confined to one school, is generally said to come from the Mei An Qin Pu (1931),4 handbook of the Meian qin school, an offshoot of the Zhucheng school of Shandong province.5 However, although the earliest surviving version of the title Yulou Chunxiao is in fact in the 1931 handbook, its tablature is almost identical that of a melody included in the hand-copied Longyinguan Qinpu (1799? ), where it is called Chun Gui Yuan (Spring Chamber Lament).6 And although Longyinguan Qinpu is said to be an early Zhucheng school handbook, if the date 1799 is correct it actually precedes any of the known early Zhucheng players. Mei'an Qinpu also has a melody called Long Autumn Night, with the alternative title Lament of the Autumn Chamber.8 This melody is said to have been adapted for the qin from the pipa repertoire, and indeed it does have some characteristics similar to pipa idiom (finger rolls in particular). Although Spring Chamber Lament does not have such characteristics, one can speculate that its melody originally existed outside the qin repertoire. On the other hand, its many octaves and unisons are particularly indicative of the qin idiom. This composition is also known as "Spring Chamber Lament." The melodic quality is light and flowing, really quite out of the ordinary. Its significance is the dream-like, intoxicated state of first awakening from spring sleep. The third phrase of the third section, after the shuang-yin (double-vibrato) technique, is just like stretching after awakening - a lifelike, masterful portrayal. The extraordinarily clear harmonics in the coda are most amazing. 21296.683 玉樓春 Yu Lou Chun (Spring in a Jade Tower) concerns the cipai of this name (set for qin in 1682; in addition to these and those below there are also lyrics by Li Qingzhao), quoting the 詞譜 Ci Pu; it also discusses qupai and opera names. 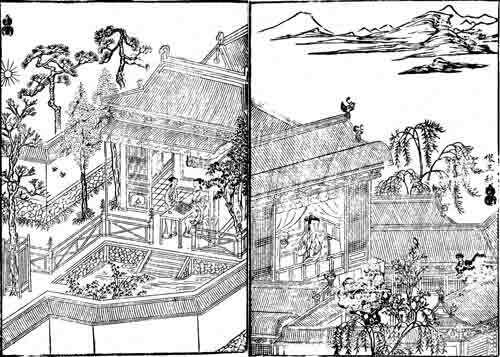 4/510 has only 玉樓 yulou, which it defines variously as a beautiful tower, abode of a deity, 妓樓 tower of a "skilled lady", in Daoist religious terminology the shoulders, and 玉樓子 a kind of peony. "Lou" by itself also means "upper story", etc. 21296.684 玉樓春曉 says only that it is 菊花之一種 a type of chrysanthemum, nothing about music and no poetry references. It has no musical connection to Chun Xiao Yin or any of the other chun xiao melodies (see Zha Guide). Lieberman translates the title Spring Dawn at Jade Tower. Elsewhere one can find Spring Dawn under the Jade Pavilion, etc. See further comment under 蕤賓 ruibin diao. Not yet translated. See also below. Zha Guide 44/--/-- lists Yulou Chunxiao as only in Meian Qinpu; Zha Fuxi in the 1950s was apparently not aware of the earlier Zhucheng school handbooks (see below). His Guide also does not have the afterword, as that was not included in the handbook until its 1959 edition. These are included in a list of early Zhucheng handbooks. Of these I have only seen Longyinguan Qinpu, so do not know whether the others also they include the present melody. This is the title for Yu Lou Chun Xiao as published in 龍吟館琴譜 Longyinguan Qinpu (1799? ); it is unrelated to the earlier Chun Gui, which was related to Chang Xiang Si. Longyinguan Qinpu is said to be the earliest known handbook of the 諸城 Zhucheng school, which originated in Shandong. The Mei'an school was an offshoot of Zhucheng. 引起春閨愛月心。 A moon-loving heart has been aroused in spring chambers. 14146.569 春閨怨 Chun Gui Yuan says only "曲牌名 name of qupai" (opera lyric type). The melody does not seem like a lament, suggesting that the title Spring Dawn from a Jade Tower is more appropriate than the older Spring Chamber Lament; perhaps earlier name came from the qu structure rather than the mood of the melody. However, the pattern of the melody does not fit the lyrics as found in any surviving poems of that title (see below). The online translation of the title Chun Gui Yuan is commonly Lament of the Spring Boudoir, specifying that the viewpoint is that of a lady. As explained above, this indeed seems most likely. In addition New Songs from a Jade Terrace (玉泰新詠 Yutai Xinyong) has one of this title by a 6th century poet named 吳孜 Wu Zi. The translation is by Anne Birrell from her Penguin edition of the above title (Penguin edition, p. 267). 借問不相諳。 May I ask, Don't you know me? 窺窗來見參。 Peeps through my window to visit. 忽值日東南。 Suddenly I find the sun veers south-east. 桑葉復催蠶。 Mulberry leaves hurry on the silkworms. 孀居自不堪。 A widowhood I can't bear. None of these poetic structures aligns with the qin melody structure. 25505.502 only 秋閨 qiu gui: 秋季之閨房 women's quarters in autumn. The title of this melody is clearly parallel to that of Chun Gui Yuan, which is also in Longyinguan Qinpu (1799). 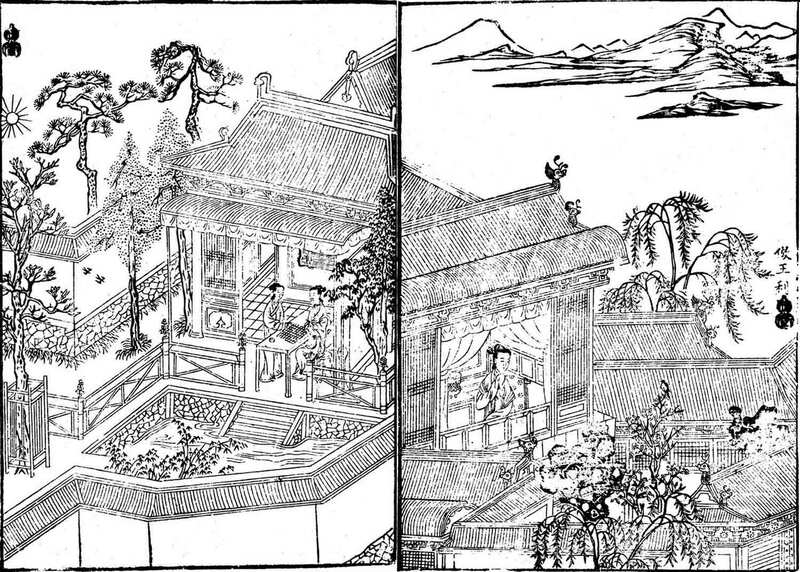 The version in Mei'an Qinpu is again nearly identical to that of 1799, though again with a different title: Long Autumn Night (秋夜長 Qiu Ye Chang). The 1959 commentary, after mentioning the alternate title, says it was arranged from a pipa lute melody. An interesting aspect of this 1959 commentary is that it says the transcription may have been done by the earlier Mei'an master 王燕卿 Wang Yanqing, who lived 1867-1921. If the 1799 date of Longyinguan Qinpu is correct, clearly this statement is incorrect. 21296.683: name of a 詞牌 cipai, 曲牌 qupai, 劇曲 juqu and the most famous type of peony. Zha Guide 36/--/526: only in 1682 (XII/364) and 1687 (XII/395; same lyrics, completely different music). The lyrics seem to have been newly written: I have not found them elsewhere. This book, pp. 92-94, in addition to translating the afterword, has a transcription of the melody (without the tablature) plus further commentary.